Mr. Isidor Cohen will preside. Cohen, Mr. Lewis Brown, Mr.
Wolf and Mrs. Lewis Brown. (Omni. ; 5. Rabbi Israel H. Weisfeld; 6^ J. Loui^ Shochet, President of Beth David and Building Comm. ; 7. Jos. M. Fine, 1st Vice President and Building Comm. ; ft.
were omitted from the above. Their photos will appear in our next issue. Ty puests were pi ess at. L rar. Mrs. J I_ Shochet. beta *a *e cake whaei ^a- *.? :r:-.- :--..- A" a ".i"- "
. n a. :tk \\t. :*: ? m. *- .w. mi b, w nth t.
*W N. a. 2nd km. v !*! S. W. 1-ita St.
Lews Brows Mrs R V. .
Tr.-e ssaaj fr.rr.d : Mrs.
1400 S. W. First Ave.
"The Home of All Around Adequate Protection"
to have erected a building such as this new Talmud Torah. 30L' S. W. 4th Ave.
Jew.sh martyrdor- spired tdeahsm? lueref-re. n the orpee m eg emetiem of these staunch ." by the Mens Club of Miami. :- ; ~it:ee. Mr H. H.
arti ?::. M-rra;. A A stet. wh; was thee the Rabbi t"
ia s t" ". ? "2" 7" -. ifies a woman for the talkies. certain hour in the afternoon. "Put over a straight one." take its place with the. eased rB&tives of the donors. soJiilMi.itf of a Talmud Torah. lei I Secretary; Mr. J.
i in] |The President, Mr.
Mr. Shochet, Mr. Samuel J.
was made and prevailed, Mrs.
register in the Talmud Torah. ing the Club at breakfast. Brown, and the President Mr.
of Mrs. Isidor Cohen, Mrs.
mud Torah a realized fact. 17 S. W. Fifth Ave.
WILL SUPPLY YOUR EVERY WANT! CREAM AND ALL DARIY FOODS. WE SUPPLY YOUR EVERY WANT! our new Jewish section, operated according to the Jewish ritual. were in possession of the fort. all the members of the troop. ceremonies to be held May 30. "For the Preservation of Your Clothes"
he vjimt of Herbert E.
time for the High Holidays. nis players of the Country. "I am a woman and a Jew." 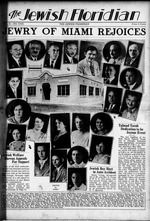 Rae Rosengarten, Mrs. A. L.
Music club at Mazica Hall. bert E. Scher and Stanley C.
The committee of Mess. J.
banquet soon to be held. arrve from Washington, D. C.
the early part of next week. Mrs. S. J. Spector, Mrs. J. 44 S. W. Sixth Ave.
Engler, Mrs. S. Abenson, Mrs.
Wolf, Mrs. Al. Goshen, Mrs.
Cromer, Mrs. J. H. Katz, Mrs.
,to leave the Hospital shortly. on the 16th of June. 300 N. W. 3rd Ave.
will be held at the Synagogue. ed dailv by Mr..B. Silverman. 23 N. E. 2nd Ave.
K. Shochet. Rabbi Israel H.
In the evening at 7:30 p. m.
Isidor Cohen and Stanley C.
127 N. W. Fifth St.
residing in the same City. reau by enrolling as members. the religious life of the Jew. At F. E. C. R. R.